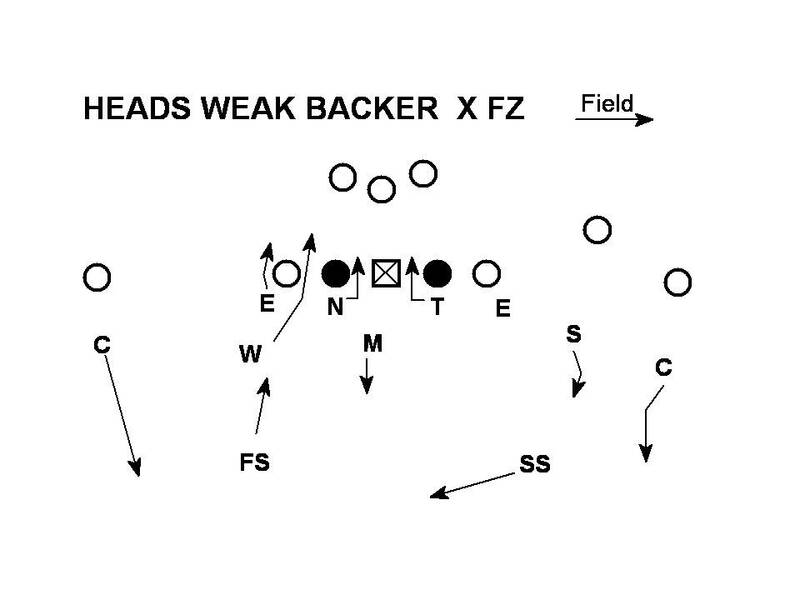 This week's Blitz of the Week is from our playbook and is a simple 5 man choiced pressure concept from a 4-3 with 3 under 3 deep, 4 under 2 deep, or man free coverage behind it. This concept comes from a 2 high safety shell. The front is set to the field. 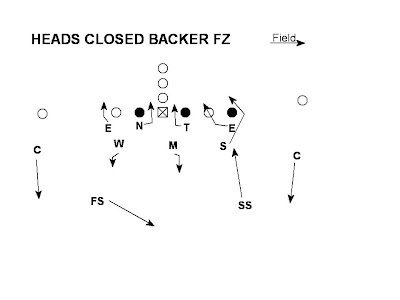 The first blitz in the concept is Closed Backer which is a blitz to the TE. 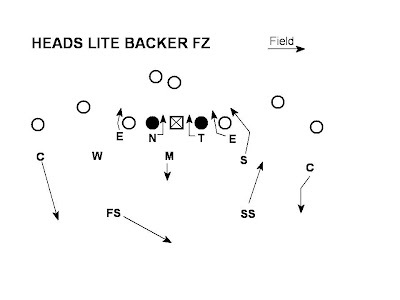 The blitz is either the Sam or the Will based on the alignment of the TE. 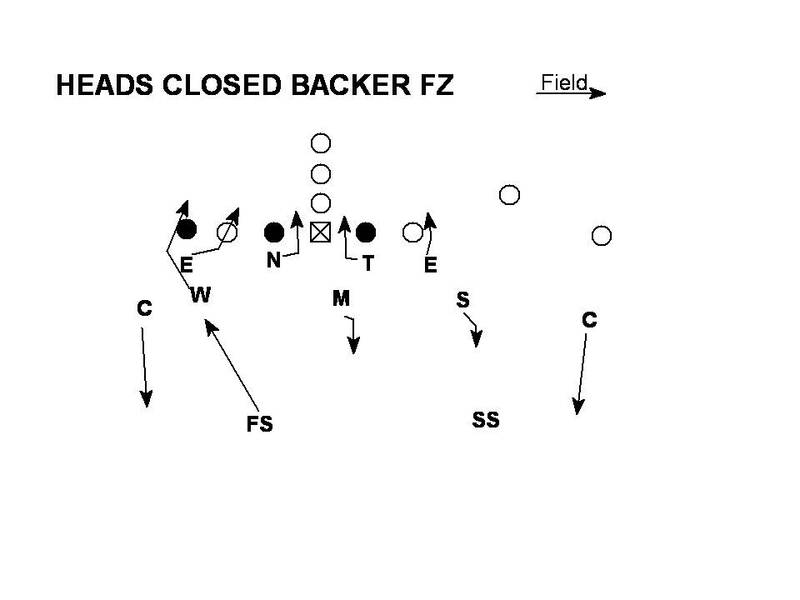 In this example the TE is aligned to the field so the field LB (Sam) is the blitzer. The same call will be a different blitz if the TE is aligned into the boundary. 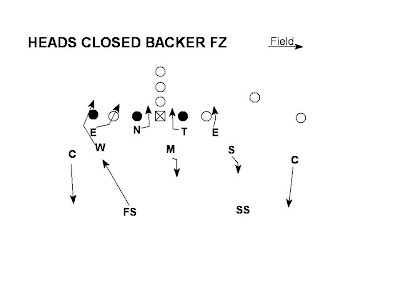 The Will is now the Closed Backer and needs to give a "Fire" call to the End and Edge blitz. The Sam knows IF he is not blitzing he is a seam dropper. 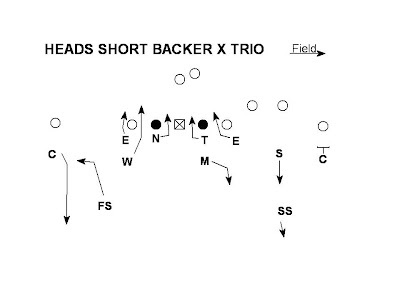 The Mike is always the 3 RH and the Safeties know "Closed" is a TE side invert. We have multiple tags to get the blitz where we want it. Heavy and Lite have been good vs. shotgun spread teams. The Sam is the Lite Backer (opposite the RB) and is the blitzer. He will still make the "Fire" call to tell the End to go inside. We also tag the blitz to change where the blitz is hitting. The Will is the Weak Backer because he is aligned opposite the pass strenghth. If the formation was into the boundary the Sam would be the Weak Backer for this blitz. The "X" tag tells the Will to go inside. The Will gives the End an "Echo" call telling him to stay outside instead of the normal "Fire" call. 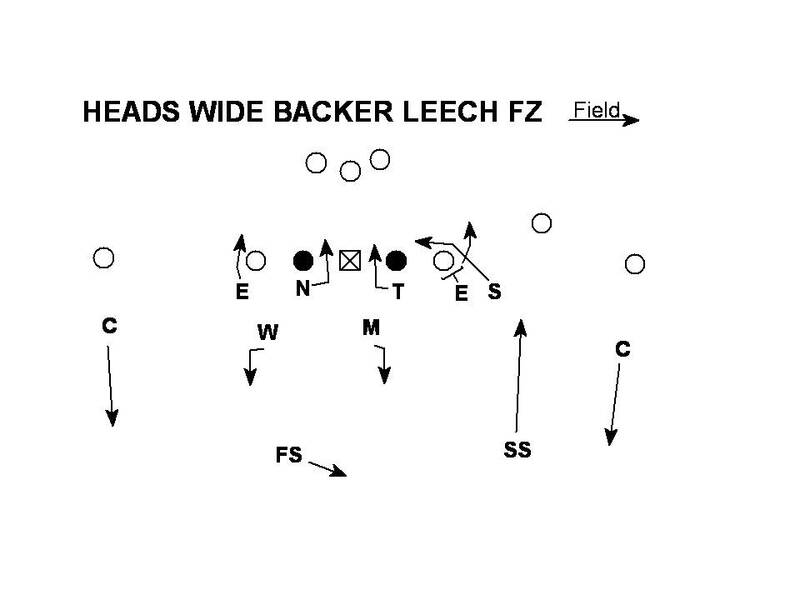 The "Leech" tag tells the blitzing backer to show the blitz and come flat down the LOS off the edge. 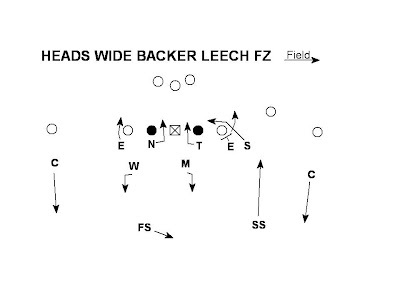 The blitzing backer will give a "Leech" call to the End instead of the "Fire" or "Echo" call. Leech tells the End to latch on to the OT and then contain. More information on the Leech technique is available in a previous post here. 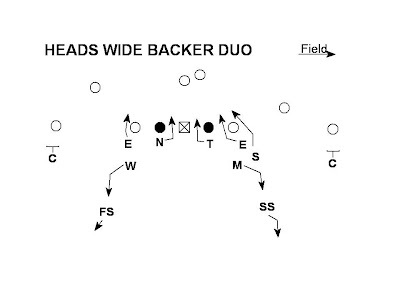 We will also utilize a 4 under 2 deep concept to cover down behind this pressure package. 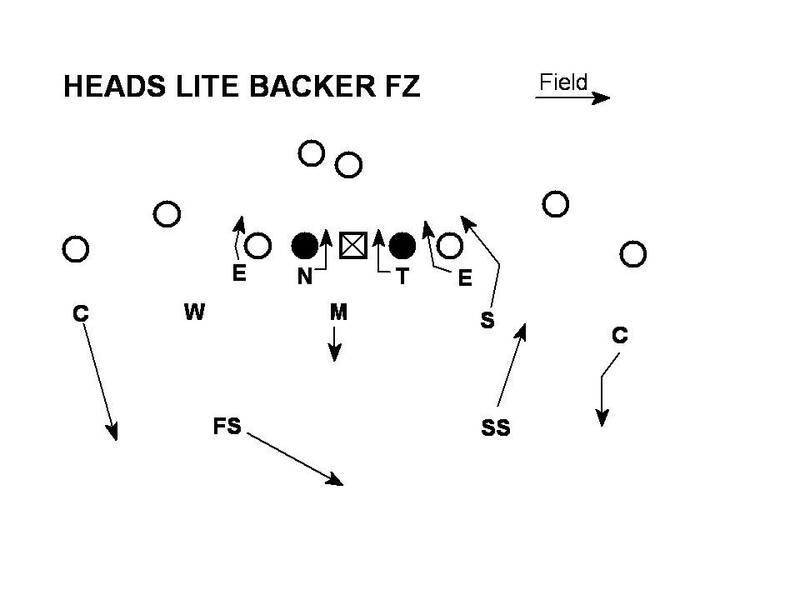 The blitz concept is exactly the same as before except now the coverage is Duo which is both corners in the flats, both safeties in Deep 1/2 and both non-blitzing LB's in the Hook-Curl drops. Vs. a 3x1 to the field we will either check to FZ or check the coverage to Trio. Trio keeps the field side hard corner in place. 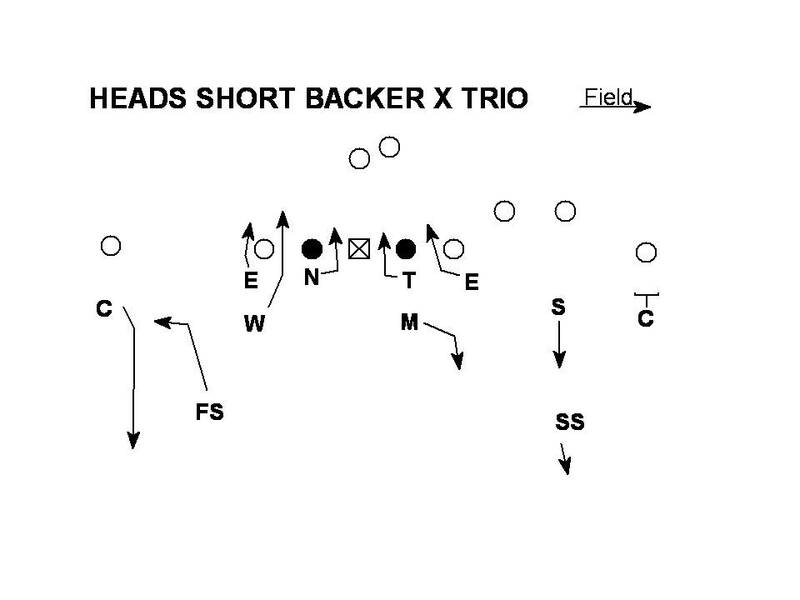 If the blitz is coming from opposite the trips the FS needs to invert. 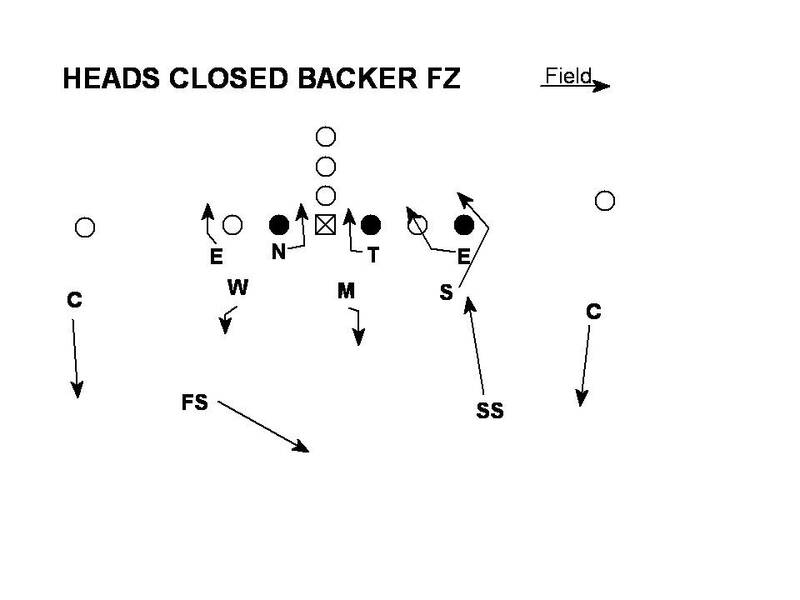 The safety to the blitz always inverts and in this case the FS will take the weak Curl-Flat drop opposite the trips. To the field the Cover 2 concept is still intact. 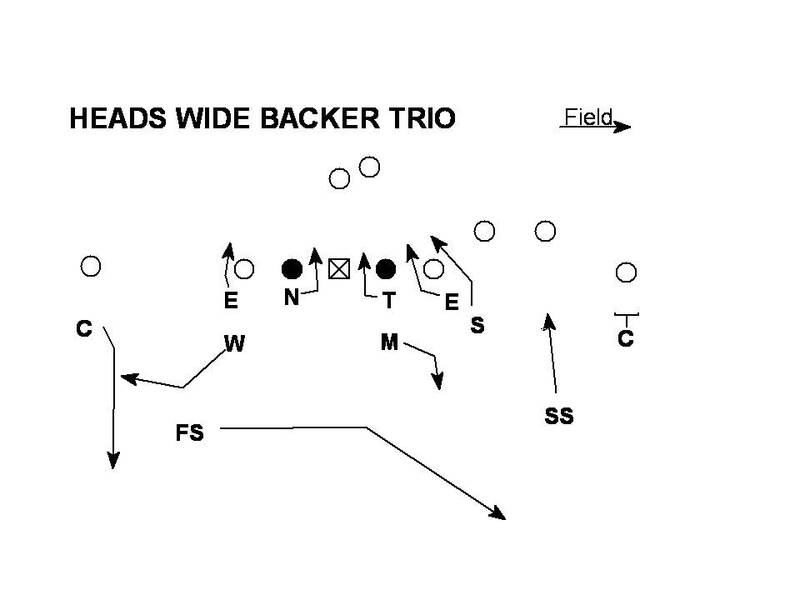 Many teams are working under the assuption that a blitzer + an inverting safety = 3 under 3 deep. 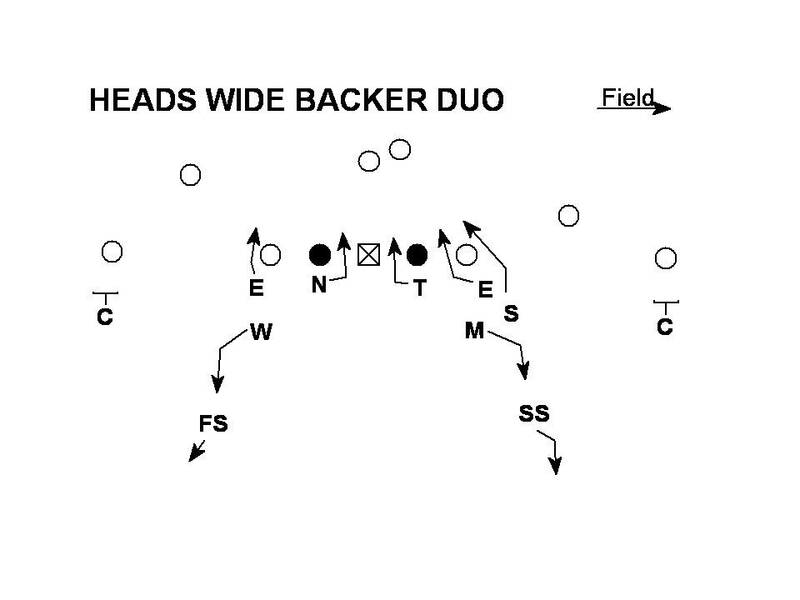 One way teams have tried to capitalize against our pressure package is to attack the flats when they see a blitzer + invert. Duo(w/ Trio check) is one way to make teams pay for that assumption.